The other day I was listening to the Fresh Air while out on my errands and it was a great show with Pamela Paul of the NY Times talking about her book My Life with Bob. I really enjoyed the interview. She spoke about being a life long reader, and there were so many things about her childhood reading that reminded me of my own experience. I remember in seventh grade English we were tasked with listing each book we read on a 5 x 7 card, including a short review. During that school year I read almost 400 books and received a certificate, which was pretty cool in 1968. I also loved the segment on book reviews and writing. I've always love writing but am not very good at it, mostly just writing in the same manner I speak. Anyway, during the interview she shares a favorite review by Michael Lewis. She remembers the first sentence being something like "he's written a good book, let's get that out of the way." 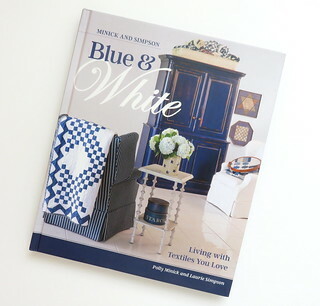 Which brings me to Blue and White by Minick and Simpson. Let me get it out of the way, it's a great book, and I loved every page. 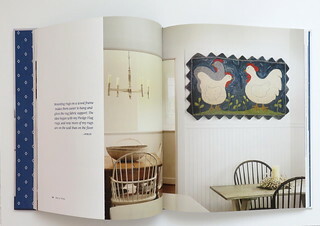 Blue and White is a coffee table style book, with wonderful photography by Brent Kane, published by Martingale. It's the perfect book to linger over, and to return to time and again. It's divided into three sections, Americana, Coastal and Classic, and feature quilts and hooked rugs in a variety of settings through out the home. I enjoyed the narrative that accompanies the pictures, insights into the creative process, and personal stories. And I'm not going to lie, I'm a complete fan-girl for the sisters, and I'm not afraid to admit it. Meeting them at quilt market and having the opportunity to chit chat now and then has me barely able to control myself on most occasions, just hoping I won't say something stupid. 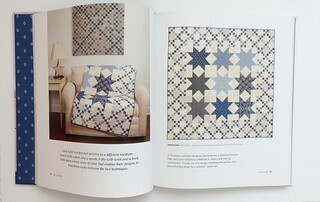 There are no instructions included for projects, but many of the quilts and rugs do have patterns and they're listed in the back for easy reference. You can find them on their website and you an follow along with their exploits on their blog. So to recap. LOVE THE BOOK. I highly recommend it! Ok that's all for me today! I enjoyed this post Pam...I've always loved reading too. I can't wait to get this book, it looks beautiful! Ah blue and white - you can't go wrong! I too was an avid reader as a child. Now I read blogs or textbooks, not much in between. I have always loved to read! I would take out as many books as they would allow from the library as a kid and walk home trying to read while carrying an armful. And just this week I had a grand time taking one of my grands to storytime. And yep, I love this book too. I got it a few weeks ago and have so enjoyed paging through the fabulous photos and stories! Hope you have a great holiday weekend Pam! I've been eyeing this book off Pam, I'm not sure I can find it in Australia though. Love all their quilts.